Three months past the holiday season, buying a Christmas tree is far from the minds of most people. The farmers who grow the trees, however, are already looking forward to the upcoming season—many with their sights additionally set on a vote next month that could eliminate a tax they’re forced to pay. Loudoun farmers are big contributors to the organization’s coffers. The county’s tree farm industry brings in roughly $675,000 annually, selling about 7,500 trees. Many farmers are speaking up against the tax as they prepare for a federally required vote in May that could eliminate the board. To spread the word and give tree farmers a voice, Frans Kok, owner of the Middleburg Christmas Tree Farm for 38 years, started Farmers Against Christmas Tree Taxation. Two months ago, after realizing that he had paid $350 in taxes last year for selling 2,300 trees, Kok contacted 4,000 Christmas tree farmers across the nation and asked them to voice their opinions through a straw poll on his organization’s website. He said the results showed that 90 percent of respondents were opposed to the promotion board and its tax. This type of taxation isn’t uncommon among various industries, however. The USDA’s Cattleman’s Beef Board charges $1 for every head of cattle sold, while its National Pork Board charges 40 cents for every $100 of market value of pigs sold, with the money used to fund research and promotional campaigns. Tree growers opposed to the promotion board’s operations are arguing that nationally advertising and promoting Christmas trees is a waste of money because there is no need to brand a commodity. Kok equated Christmas trees to the automobile industry, noting that there are no generic advertisements aimed at persuading consumers to buy cars as opposed to other vehicles like motorcycles. He said Christmas tree sales are determined mainly by the economy and cultural habits, such as religious views and family traditions. “That should give you an indication that [tree advertising] is useless,” he said. In the 2017 holiday season, the board budgeted $800,000 for its promotional campaigns, which included sponsoring tree lighting ceremonies, running commercials on the Hallmark Channel and conducting a media tour. The board reported that these efforts generated about 260 million impressions from its online reach, TV advertising and media coverage. Kok, who has a marketing and finance degree from the Harvard Business School, is questioning what those impressions actually mean. Jim Rockis, chairman of the promotion board and owner of the Quarter Pine Christmas Tree Farm in Pennsylvania, said advertising is only part of what the promotion board does. He said research is also a main focus, as it’s currently trying to develop a new species of Christmas tree by using a unique seed from Turkey. While the board currently budgets about 20 percent of its program expenses for research, about 60 percent is set aside for promotion. Aside from the board’s national advertising, Loudoun County also does its part to promote local Christmas tree farms. That advertising, though, is not paid for with tax collected from tree sales. Kellie Hinkle, the county’s agricultural development officer, said the Department of Economic Development has promoted the industry locally for more than 15 years by creating a guide that features tree farms, holiday events, farmers markets and greenhouses, which is distributed to 3,000 households and to libraries, community centers and wineries. The vote on the promotion board’s continuation is less than a month away. 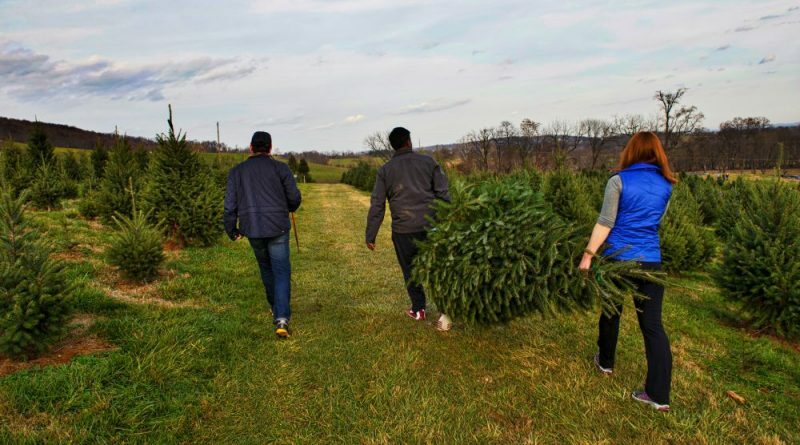 The USDA’s Agricultural Marketing Service will be sending ballots and voting instructions to all known eligible Christmas tree producers and importers, who will then have the entire month of May to cast their votes.